Store Sign Lettering For Do It Yourselfers. Store sign lettering is not as difficult as you might imagine. All it takes is some basic skills and common sense and you can do your own store sign lettering and save a lot of money. All stores have a sign and when a business takes over from the previous business and changes name or products, the stores signs have to have new vinyl lettering placed on them. While sign companies may try to get you to but a new sign or pay for fancy upgrades, the new business owner can save much money by changing out the sign lettering himself. Most stores have pylon signs that have the businesses name in vinyl lettering attached to a plastic face. All you have to do it scrape off and remove he vinyl lettering, clean the surface and then reapply new vinyl lettering to the sign. Store front windows are much the same as a pylon sign. The glass has been lettered with vinyl lettering and all you have to do is scrape off the existing vinyl lettering , clean the surface and then reapply the new vinyl lettering to the business window. You can get your store sign lettering by either using the search engine on Google or Yahoo, using craft stores like Michael’s Crafts, hardware stores sell generic vinyl lettering, or visiting one of the local sign shops in Las Vegas. 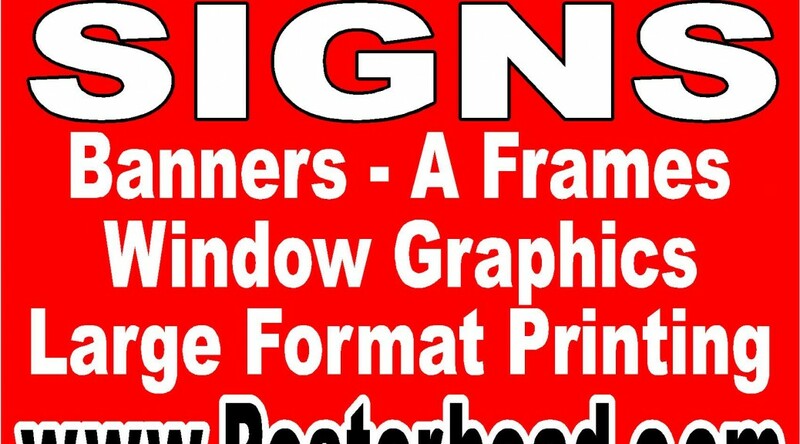 Sign shops have the ability and custom software to design your window graphics, pylon sign letters or door graphics and then plot them out on a plotter machine. if you use a sign shop, they can make representations of how your store sign lettering will look and do a overlay on the window or business sign. If you have to go into a business sign that is lighted up, be very careful and know what you are doing as electrical shock and damage may occur. In these instances, I recommend a professional for your safety. Cheap Political Banners In Las Vegas. In the election season of Las Vegas, several candidates are going for cheap political banners rather than the traditional screen printing signs made on coroplast. While the screen printing coroplast signs are cheap, political candidates are getting more bang for the buck with cheap political banners. Screen printing political signs has long been the norm in Las Vegas. Political candidates are talking about paying $24.00 for a 3ft x 6ft screen printed sign on coroplast. The coroplast signs are then mounted on fences and posts around the city with zip ties. However, with the winds in Las Vegas, the coroplast signs have a tendency to rip out the grommets that hold them down. The coroplast signs are made with 4mm material. After the wind forces too much stress on the grommet and tears, the coroplast sign acts like a big kite and flies away. This makes the political candidates angry to see the waste and makes the neighborhood look trashy with ripped up signs. Cheap political banners are becoming more popular with candidates running for office in Las Vegas. The banners fair much better in the higher winds as vinyl banner material is used instead of coroplast. Also, with a few simple wind slits, the wind can go through the banner without causing stress on the banners grommets. This process of directing the wind helps make the vinyl banners last much longer than coroplast political signs. Cost of a 3ft x 6ft banner is $36.00 with quantity discounts when ordered in large numbers. While the initial cost may be a little higher, certainly the life expectancy makes up for it. Also, large format printers are printing the banners and this allows for picture like images of the political candidate on the vinyl banners. Cheap Fast Signs Can Be Yours In The Las Vegas Sign Capital of The World. Las Vegas is the sign capital of the world and cheap fast signs can be had here for lower cost than most other places. Las Vegas is the trade show and convention capital of the world. Accordingly, the sign industry supports the Las Vegas conventions and trade shows along with the massive amounts of casinos. All the casinos literally have thousands of signs on display from the large marquee pylon signs to room direction signs. All this makes for Las Vegas being a great place to get cheap fast signs. Cheap fast signs can be found in Las Vegas. That is because of the infrastructure to support the sign industry is plentiful in Las Vegas. All the major sign equipment distributors are represented in Las Vegas. The largest sign installation companies have locations in Nevada and the sign service industry is also well represented. For example, all those flashing bulbs on the large casino signs have to be changed out regularly and there are hundreds of thousands of light bulbs that are changed annually. Cheap fast signs are also available from the mom and pop sign shops as well. These mom and pop type stores have state of the art large format printers that allow them to create cheap signs at a fraction of the cost that they could have been produced 20 years ago. In previous times, if someone wanted a vinyl banner, the design would have had to have been made and then vinyl lettering in different colors would have had to have been plotted or cut and then attached to the vinyl banner. Nowadays, large format printers print these banners out in a fraction of the time and at less cost. This makes Las Vegas the perfect place to get fast cheap signs. Cheap fast signs are easily obtainable in the sign capital of the world. The signs and banners are produced in the most brightest and vivid colors. Businesses are all looking for an advantage over the next business. In these tough economic times, we all need to sharpen and hone our marketing to attract new customers and keep the ones we have. Low cost banners are an opportunity to spread our business information and products out in a large way. Low cost banners can be strategically placed on the businesses building or area controlled by the business. Fences, trees, large vehicles are opportunities to place a low cost vinyl banner. These low cost banners can be visible from a great distance. They make for small billboard. Motorists and pedestrians would be able to see these banners from far away and know what specials or products you have on sale. Low cost banners are printed on 10 ounce to 20 ounce banner material with the use of large format printers. The large format printers print directly on the banner material using eco solvent and latex inks in the c-m-y-k format. The time to print a 3 foot by 8 foot banner is approximately 15 minutes with the use of these large printers. It was not to long ago that sign shops were making banners with vinyl lettering cut from a plotter. This vinyl lettering method was very time consuming and the price was reflective of the manpower. With large format printing, the machine does all the work for less price. Vinyl banners are not expensive and can easily be made with simple Adobe Illustrated software, photoshop, etc. Many of us have this type of software on our computers at work or at home. The cost for a 3×8 foot banner, or 24 sq ft is less than $40.00 in Las Vegas. Larger banners can be made for about $2.00 a square foot. These low cost banners make opportunities for businesses to get there name and products out to the public in a way in which they can easily be seen. It is hard to miss a large banner on the side of a building. Discount Banners Can Make Your Business Take Off In Las Vegas. Discount banners can really get your business noticed, especially in Las Vegas. With banners getting more popular for businesses trying to effectively marketing there good and services, discount banners have become more of a viable option in spreading information about their business. There is no doubt that hanging banners on your building or surrounding area increase business. Several online companies are making are making less than a half dozen banner options and selling them at a discount. They do this because they are setting up their manufacturing and printing process for certain colors and styles and then specialize in them for product efficiency. I have seen ” grand opening banners” in 3 colors selling for less than it would cost to produce at a local sign company in Las Vegas. These companies are located near manufacturing plants and take advantage of seconds and damaged materials to profit maximize. Also, they offer discounts to customers who order in bulk. The problem with these discount banners is that the shipping and handling fee usually negate any cost advantage. For example, if you are purchasing a vinyl banner from a sign facility in New York, the cost of shipping and handling a banner to Las Vegas, Nevada would be about $15.00 The discount banners are really not saving the consumer much money ( if at all ). Las Vegas is the sign capital of the world because of all the trade shows and conventions. Discount banners can be manufactured here in Las Vegas with state of the art large format printers. These large format printers are using the latest ecologically friendly inks that print bright and vivid colors to help attract and retain customers. If you are looking for discount banners to increase your business potential in Las Vegas, you should look no further than the local sign shops. Pull up banners are popular with conventions and trade shows in Las Vegas. The reason is simple, they are compact and very easy to install. They are also very cost effective. Pull up banners are also known in the sign industry as retractable banner stands. The banners roll up into a small compartment and then they are able to be pulled up and hung on an inclusive retractable pole that keeps them upright. The stand has legs on it that fold out giving the pull up banners stability. It takes about an average of 2 minutes to put up a retractable banner stand. The pull up banners, or retractable banner stands, have the unique advantage of being able to be placed next to each other to form what appears a very large graphic background. This is a way of displaying a large graphic background to present a image of enormity. One the show is over, you can easily take down the display in just a few minutes. This gives the unique advantage over large, burdensome backdrops that have to be rolled up and stored in large containers for re-use. Pull up banners last a long time and can be used over and over again. The cost of a pull up banner stand with banner print is not very expensive. On average, you can purchase a 33 ” retractable banner stand with a custom print for under $100.00. There are many other pull up banners available in different sizes. The most common sizes are 24″, 36″, and 48 “. The banners usually have a height that is limited to round 78″, although pull up banners can be made in taller sizes as well. Las Vegas is the sign capital of the world because of the casinos , trade shows and conventions. If you need a pull up banner or other type of signage at a low price with quick turnaround, Vegas is the place. Las Vegas Fast Signs For Instant Signage. Many businesses come to Las Vegas for trade shows and conventions. As it happens, people forget their graphics and signage back home and are in need of Las Vegas fast signs for their trade shows and conventions. Las Vegas fast signs can be yours if needed because Las Vegas is the sign capital of the world. Because of all the conventions and trade shows, Las Vegas needed a large sign industry to be able to fulfill the sign needs of visiting conventioneers and also to be able to keep up with all the casinos and their signage needs. The invention of the large format printer assisted in the development of the sign industry in Las Vegas. Large format printers can produce banners, vinyl signs, and many more printed signs at a fraction of the old cost and production times. These large format printers use eco solvent and latex inks that are ecologically friendly and are very long lasting. These inks can produce the most wonderful and vivid colors. because of these printers, Las Vegas fast signs are possible to make at low cost. The average production time on a 24 square foot banner ( 3ft x 8ft ) is approximately 15 minutes to print in full color. A full color banner means that you can cover the entire banner in all the different colors. In the old days, vinyl lettering had to be cut and then hand applied to a banner material or substrate in different layers to form the design. With large format printers, the machines do all the work, thus making Las Vegas fast signs a possibility. These large format printers can work very quickly with print speeds up to 200 sq feet and more an hour. If you are looking for Las Vegas fast signs, they are available at a low cost and at quick turnaround times. Cheap outdoor advertising in Las Vegas is a very effective way to market your company if you do not have a large advertising budget. If you are trying to market your company like a fortune 500 company, you will learn that those big companies have very deep pockets. The trick is then to get your company name and products or services out to the public as cheap as possible. if you were to talk to the local population, everybody knows and likes to help the small business. Convenience and price are a couple of aspects of marketing, but getting your name out there is another. How many of us go to a local café rather than a large franchise café because of the better quality food at a lower price. Cheap outdoor advertising is a way to get your products and services known to the local consumers. A simple banner on the side of the building will allow foot traffic and motorists to spot your business. This vinyl banner is a great way to let people ( potential customers ) know who you are. A 3 foot x 8 foot banner costs less than $40.00. 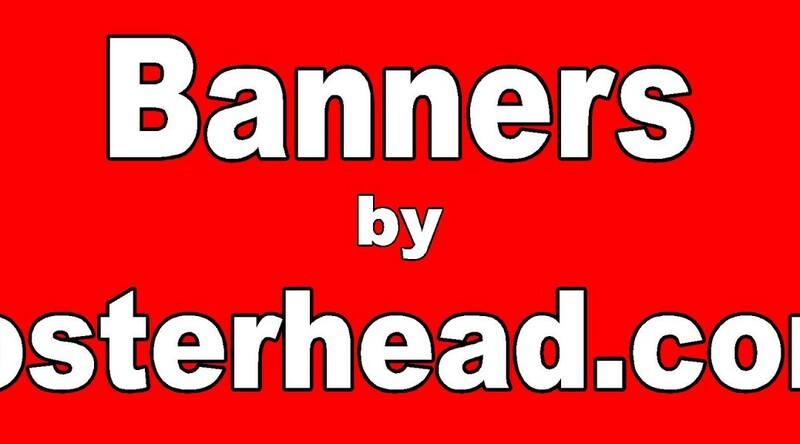 A larger 4ft wide by 10 foot long banner can be yours with your custom design for about $80.00. Large format printing and modern software design programs make the design and printing of your banner almost effortlessly. 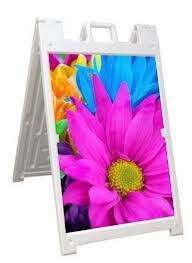 A few sidewalk signs or “A” frames are cheap outdoor advertising means of advertising. The sidewalk signs can be continuously changed out to give fresh advertising to your customers. Sidewalk signs are very effective and cheap outdoor advertising that is intended to target the local market. The cost of a sidewalk sign in about a 2foot by 3 foot size is less than you might think. A quick survey shows the price under $130 in the Las Vegas area. Cheap Full Color Banners Are Available in Las Vegas For A Cheap Price. Cheap full color banners are now available because of large format printers that use state of the art technology and the most advance inks. The new inks that are being used are eco solvent inks and latex inks. These inks are environmentally friendly, unlike the old inks that were used in the printing process. Large format printers have come very far over the past several years in the technological area. Companies like Mutoh, Mimaki, and Hewlet Packard are making large format printing easier and cheaper. Cheap full color banners can be had very inexpensively. A 3 foot x 8 foot banner can be purchased for under $40.00 in Las Vegas. This price is not for the cheap material either, these banners are printed on a 13 ounce banner material with long lasting inks that are made for indoors and outdoors. These large format printers can produce fast signs and a inexpensive price. Fast signs and quality are the order of the day with these large format printers. The print time for these cheap full color banners is remarkable. A 3ft x 8ft banner can be printed in around 15 minutes in full color. Larger 4 foot x 10 foot full color banners can be made in 25 minutes or less. This process includes making every inch of the banner printed on. Las Vegas is the king of the sign industry because of all the trade shows and conventions we have. Sign shops are well prepared with the latest technology to give everyone satisfaction and a very good price. Commercial Banners For Your Business. Commercial banners will increase sales for your business or allow you to let Customers know of an upcoming event. Commercial banners are very inexpensive and are great way to increase sales. Commercial banners can be made out of a variety of materials. Commercial banners can be made out of mesh vinyl, vinyl banner, paper, etc. The most common banner material is the 13 ounce banner material. The 13 ounce banner material is the standard of the industry because of its wear factor. There are several other vinyl banner materials that consist of different weight, but 13 ounce is the most common . The heavier the banner material, the more durable it is said to have. Therefore, a 20 ounce banner material has a far greater likelihood of a longer life than a 10 ounce banner material. A mesh banner is more likely to last longer than a comparable weight vinyl banner material because it has slits in it that allows for wind to pass through the banner. A solid banner material has to deflect the wind or it flies away like a kite and tears the grommets that anchor it down. Businesses use banners many times to deliver a marketing message to their customers and potential customers. Commercial banners are usually attached by the business owner to a fence or to the business building. The higher the elevation of the commercial banner mounting allows for more people to have the opportunity to see the banner. Many businesses use commercial banners to also notify customers of a grand opening or a change of ownership. These large banners can be seen more easily by people and stores use them to get a message across. The cost of banners is not very expensive. A 3 foot by 8 foot banner in full color in Las Vegas can be found for less than $40.00. Larger banners can be custom made for around $2.00 a square foot.